We know it when we see it…and it smells a little. Essential services that are dominated by a few large players result in tight contracts and even tighter pricing options. More concerning is the hospitable environment for market control and price influence. With money and market share at stake, there is little incentive for those in the driver’s seat to call for change. At the risk of getting morbid, if you’ve had the misfortune of burying a loved one in the US in the last few years, you likely paid one of the few stakeholders who run nearly all mortuary services in America. Just a handful of companies control most of the $20B death industry. One enterprise sells half of all caskets, while another owns more funeral homes, cemeteries and crematories than any other company in North America. North of the border, Canadians railed against the three cell phone carriers who control 90 percent of the market and were charging some of the highest prices in the world for cell service – and that included a mandatory 3-year contract to boot. Price fixing, anyone? The circumstances that lead to these market conditions aren’t maliciously orchestrated. They develop organically or arise out of economies of scale. Small operators who can’t compete are often acquired or simply put out of business. 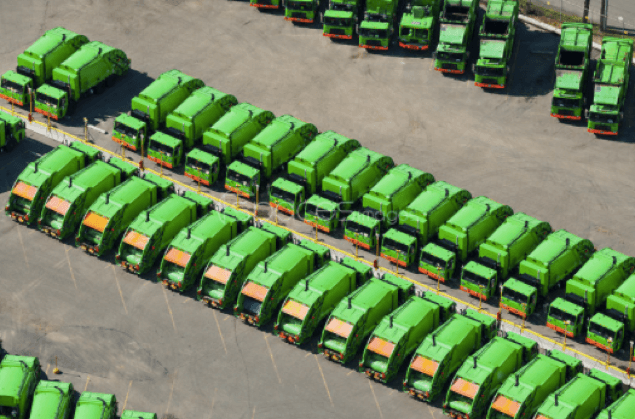 An oligopoly is flourishing in the waste management industry as well, rewarding just a few organizations with bloated contracts to handle some of the largest waste operations on the planet. By 2020, waste is expected to be a $139 billion market in North America. The waste management business is comprised of a few major operators; the king is Waste Management, followed by Republic Services. Waste Management, the company, dominates the market in three key waste lifecycle services: hauling, collection, and landfill operations. Here’s a look at their market share and that of their nearest competitor. Classic characteristics of an oligopoly don’t leave much room for innovation or competitive business models. When just a few organizations control the entire value chain, it’s not surprising inefficiencies thrive. But when outside forces create opportunity, change is inevitable. Emphasis on zero waste is bringing new legislation to bear, starting with controlling waste from the largest waste makers: municipalities, manufacturers and large business operators. Proof of mandatory waste reduction will become increasingly common and will necessitate transparent, accurate reporting on bin weights and landfill hauling trips. The Industrial Internet of Things, machine-to-machine communication, and cloud computing. Virtually all new services will track data and provide insightful reports that are available anytime, on any device. Cutting waste from the waste collection process itself is a good example of how tech is already transforming the business. Too often, collection trucks (operating on fixed schedules) make unnecessary trips to empty partially filled bins, streaming needless pollutants into the air. Smart sensor technology can now report when refuse bins are full and trigger pickup notifications to haulers. It’s a long-overdue fix to a persistent and inefficient process. As the largest waste management companies begin to adopt new tools, the latest technologies will improve efficiencies, offer greater insight into waste processes and create easier compliance with mandatory waste audits. Small, tech companies are making an impact working closely with the behemoths of the industry to drive more transparent and sustainable operations.